"I never thought I would be here, at this point in the Giro with an advantage like this," said maglia rosa wearer Di Luca, obliviously happy with his 2'24" lead over Andy Schleck (Team CSC). "The race is not over, and I have to watch out for Schleck." He is prepared for Saturday's run. "I have done the complete 43 kilometres in training, and I know the parcours." 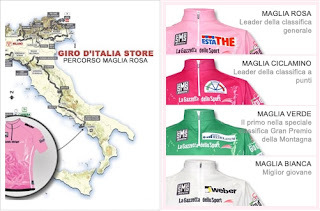 The Maglia Rosa reckons he has an "80 percent chance of winning the Giro now. ... This is already a high percentage." He continued, "I feel much more secure now that Mazzoleni is two minutes further [back] than before this stage. Until Saturday evening, it's impossible to say more." 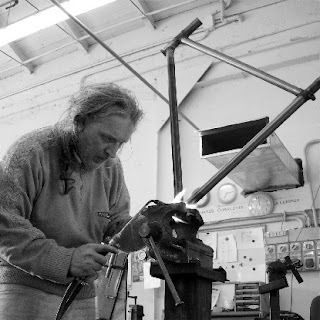 And, "I am not afraid of the crono; I will do it at my maximum - I have too. I will make sure to get time checks over the whole course." Schleck will confront his final exam in the Corsa Rosa; the 43-kilometre run to Verona should give pundits an idea of what he can do in a time trial after nearly 21 days of racing. "Now I have two objectives, the Maglia Bianca and the podium," continued Schleck. "But it is not a dream, the only stage that will make the difference will be the time trial; I can't catch Di Luca, and Simoni should not catch me." The white knight put enough time into Riccardo Riccò (Saunier Duval-Prodir) to ensure the young rider's jersey would stay on his shoulders, and, at 2'24" behind Maglia Rosa Di Luca he seems ready for a podium spot in Milano. Photo: DiLuca on Zoncolan where he held onto the maglia rosa and established his lead time before the TT stage. After the Pedalata in Rosa the next planned trip is the annual Gruppo 1 one week club ride. 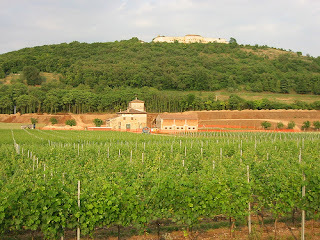 This year it is to Puglia, the "heel" of Italy. Last year we did a giro around the entire island of Corsica, a 650 km ride with lots of climbing. That left little time for enjoying the beaches so this year's tour will be decidedly less intense. This year we are "only" riding 565 to 600 Km. We will be taking the club van and two cars from Verona and driving to Castellaneta Marina, a distance of 890 Km. The ride plan calls for always riding the coastal roads, except for going into the interior as indicated. Full story and photos when I get back. 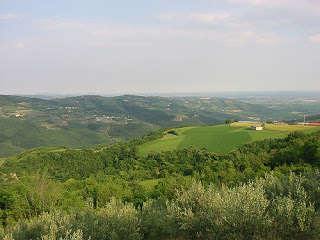 If you turn off the Pissarotta, climb, and turn back south you will come to a turn-off that takes you to Moruri, Castagne, Montorio and eventually back to Verona. 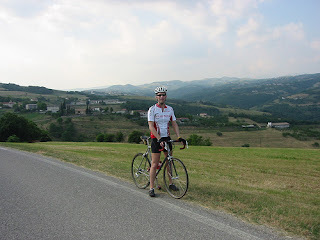 It's a beautiful ride and you are probably not further than 25 miles from Verona at any point. 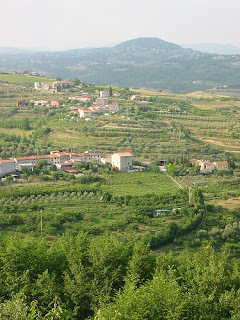 This area, in the photographs above, is northeast of Verona. If you were to go west from Verona you would be in the Lake Garda/Monte Baldo/Valpolicella area with yet more climbing opportunities. 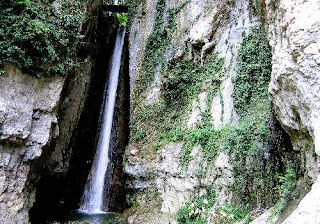 The further you travel due north from Verona the more the climbing gets serious. If you are lazy you can head south/southwest into the Po valley where it's absolutely flat. 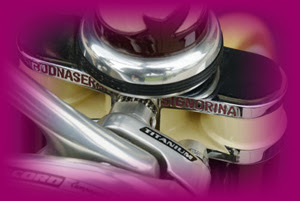 I've previously mentioned my Verona built early 1990s Malagnini bike . I like steel bikes and this one, in Columbus SLX, rides wonderfully. 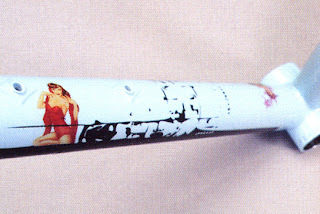 Here are some closeups of the details. 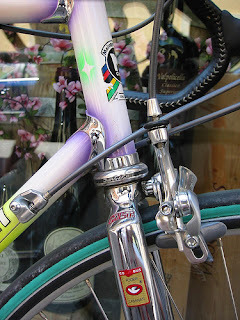 After concluding his business in Milano on Friday a.m. Brent took the train to Verona, with his trusty Hampsten S&S coupled bike, and settled into a hotel. We met a 4pm for the Pissarotta ride. First, we took a detour up the Torricelli climb that was used in the 2004 road world championships that were held here in 2004. It was the first time I rode the Pissarotta in the late afternoon and the colors on the hills were were quite beautiful. The Saturday club ride took us to Borghetto. 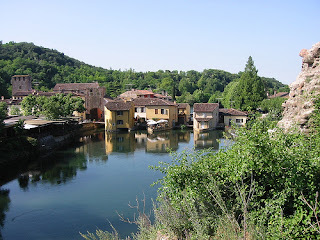 Borghetto, a name of Lombard origin that means “fortified settlement,” is the first settlement that developed near the ford across the Mincio river. From there we visited the Castellaro Lugasello which was built between 1100 and 1200. The Sunday Eros Poli group ride took off like a jet at 0800 and did the big climbs at Monte Baldo, starting with the climb to Spiazzi. When we got together for the farewell dinner on Sunday night it was pretty evident that we had gotten in plenty of riding as we both looked pretty tired. I estimate we managed 240km +. Last year when I did the Maratona dles Dolomites I opted to do the medium rather than the long course. The difference being more KMs and the Passo Giau, a 9.8-kilometre ascent at 9.4% average gradient. I just wasn't sure if I had it in my legs to finish if I took the turn-off for it. This year I'm hoping to do the long course, and hoping for "good" legs and good weather that day. So, it was with interest that I watched stage 15 of the Giro today from Trento to Tre Cime Di Lavaredo which included the Passo Giau. As www.cyclingnews.com reported: "As the Passo Giau began in Selva di Cadore, Piepoli then hit the front on the cloudy wet road with temperatures in mid-teens (C) but no rain was falling. It was the fourth time in Giro history over Passo Giau as only Pérez Cuapio, Parra and Rasmussen could stay with the two Saunier Duval riders (Piepoli and Ricco). A fifty strong Gruppo Maglia Rosa was at 3'15" with Liquigas riding well with Spezialetti on the front, but after three kilometres of Giau, Paolo Savoldelli moved to the front and notably upped the pace as he was working for teammate Eddy Mazzoleni. 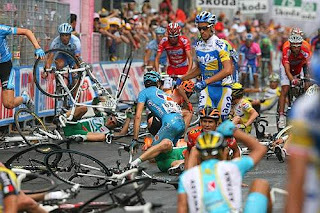 This blew the Gruppo Maglia Rosa apart, with all of Maglia Rosa's Liquigas teammates going out the back. Cunego was also isolated, as Bruseghin and Vila were dropped. 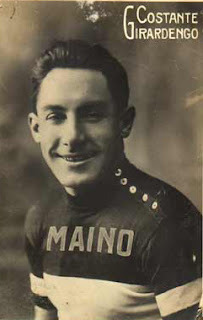 At the front of the race, halfway to the summit to Passo Giau, Piepoli's powerful progression had already popped almost everyone in the break, except his teammate Riccò, magic Mexican Pérez Cuapio (Panaria) and Parra (Cofidis), while the ever diminishing Gruppo Maglia Rosa was at 3'10" with just eight riders left; Savoldelli, Mazzoleni, Schleck, Simoni and Arroyo. 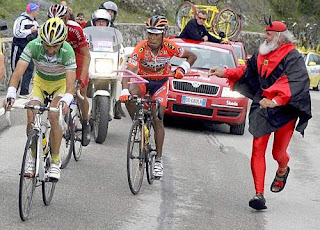 As Didi Devil ran alongside the break with three kilometres to the summit of Passo Giau, Pérez Cuapio took the devils trident from him and poked Piepoli, then gave it back to the German! The magic Mexican was pleased with himself and cracked a big smile, as next to him, Colombian Ivan Parra was struggling with the ascent. Behind in the Gruppo Maglia Rosa at 2.7 kilometres from the summit of Passo Giau, Di Luca got tired of Savoldelli's antics and said "basta." 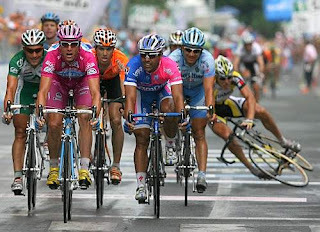 The Maglia Rosa accelerated hard and only Schleck, Mazzoleni, Cunego and Simoni could stay with him. Up front, sat the 40-kilometre to go arch, Piepoli slowed slightly and Riccò then took over on the front. The riders put on their wind jackets as the temperature was just five degrees and at the summit of the 2236m high Passo di Giau. Di Luca's pace had personally pulled back 30" to 2'45", with Savoldelli, Petrov and Pozzovivo chasing hard at 3'15", and Garzelli, Bruseghin and others chasing at 4'30". 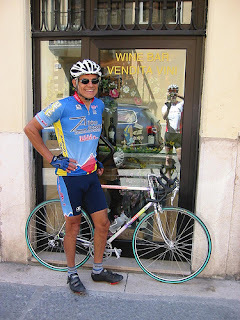 Parra was gapped by Piepoli and Riccò on the fast 20-kilometre descent to the world famous ski resort of Cortina d'Ampezzo as was Pérez Cuapio, the break passed through Cortina d'Ampezzo and both Parra and Pérez Cuapio had rejoined the break. As super descender Savoldelli regained the Gruppo Maglia Rosa, he went to the front and attacked with his teammate Mazzoleni on the descent in Pocol with 28 kilometres remaining. It was a brilliant move that would have major consequences in the final outcome of the stage......". It's always entertaining to me to be riding on the same roads as the pros and challenging myself. 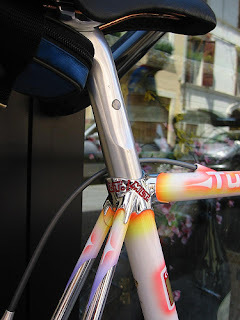 I've registered for the "Pedalata in Rosa" for June 2nd. 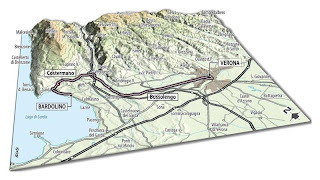 This is an early morning mass ride on the Stage 20 40km TT course from Bardolino to Verona. Everyone will be wearing a pink jersey, it's a spectacle I didn't want to miss! A few hours later the pros ride the same course. Only faster. Not to leave all the city bike people out of the fun, the organization GLI AMICI DELLA BICICLETTA has organized a tour of the city ending at the finish line of the TT course in Piazza Bra. The TT is already on the minds of the Giro leaders. Di Luca said today (Stage 14),"Simoni might have spent more energy than Cunego and me and it's possible that he'll pay for it tomorrow. But he also has taken 50 seconds back. I'm not anxious about that. I still have a comfortable margin on him (2.42). I can even lose one or one and half more minutes on the Tre Cime and the Zoncolan (climbs) but I want to keep a one minute advantage before the (final) time trial in Verona the day before the finish in Milan because Simoni and I are pretty much equal against the clock." Giro d’Italia in arrivo, forze dell’ordine in pista. I 42 chilometri della cronometro Bardolino-Verona del 2 giugno con arrivo in piazza Bra si annunciano come una grande festa per tutti gli sportivi, una vetrina internazionale per la nostra provincia, e una spaventosa via crucis per gli automobilisti: la 20ª e penultima tappa del Giro, infatti, non sarà solo un calvario agonistico per i ciclisti impegnati nella conquista della maglia rosa, ma si annuncia anche come una vera tribolazione per tutti quelli che si metteranno al volante. E per polizia, carabinieri e vigili che dovranno presidiare strade e controllare il traffico. Per questo, ieri mattina, in Prefettura c’è stato un vertice tra i comandi della polizia municipale dei comuni attraversati dal percorso (Bardolino, Garda, Costermano, Rivoli, Pastrengo, Bussolengo, Verona) e da quelli limitrofi (Torri, Malcesine, Cavaion, Lazise, Affi), dai carabinieri, dalla polizia stradale, dalla guardia di finanza, da Veneto Strade e dagli organizzatori del Giro. A coordinare l’incontro il prefetto e il questore. Per loro un compito impegnativo: mettere in piedi una gigantesca macchina organizzativa che oltre a presidiare le strade nell’immenso reticolo viario che attraversa l’asse Verona-Bardolino nel week end della festa della Repubblica caratterizzato da numerosi eventi (c’è anche il Giulietta e Romeo di Cocciante in Arena), e dall’arrivo di flotte di turisti sul Garda, dovrà anche disporre il piano dei soccorsi e dell’assistenza. Per questo sono già state allertate Protezione civile (si è riunita in serata in Provincia) con le 15 associazioni della consulta del volontariato, le Asl, il personale e i mezzi di Verona emergenza e l’ospedale di Bussolengo. Un esercito di centinaia di uomini per una giornata che si annuncia campale. L’imperativo, però, oltre a quello di chiudere le strade, è anche mettere a punto e distribuire informazioni sulla viabilità alternativa in tutta la zona del lago per aggirare la gardesana: i corridori partiranno con un solo minuto di ritardo l’uno dall’altro e per questo, a differenza dei mondiali di ciclismo, non saranno permessi attraversamenti impedendo così di fatto i collegamenti tra la zona a sud e quella a nord del percorso. Snodo critico potrebbe rivelarsi Affi, che si potrà raggiungere sia in autostrada sia con la statale 450, anche se è sconsigliato visto che poi, una volta arrivati lì, si rischia di rimanere imbottigliati. Per evitarlo, sulla A22, sulla A4 e sulle principali arterie stradali saranno disposti dei segnali luminosi con indicazioni e percorsi consigliati. Indicazioni simili anche per tutti quelli che vorranno raggiungere la città. Qui le forze dell’ordine e di soccorso sono pronte ad affrontare l’evento, si parla di 100 mila persone, con una organizzazione simile a quella disposta nel giorno della visita di Benedetto XVI. A Verona la circolazione lungo Corso Milano, circonvallazione Maroncelli e Oriani e in Corso Porta Nuova sarà bloccata già a partire da mezzogiorno e rimarrà ferma fino a dopo le 17. Per garantirla solo la polizia municipale schiererà 80 vigili e tutti i mezzi a disposizione. In strada anche la protezione civile e le associazioni di volontariato. Loro, dice Sergio Zecchinelli, il responsabile della sezione scaligera, di uomini ne potrebbero garantire anche 300, con le stesse funzioni svolte in occasione dei mondiali di ciclismo. E per quanto riguarda il piano sanitario, invece, il 118 ha predisposto un punto fisso di soccorso in piazza Bra, cinque ambulanze pronte a intervenire lungo il percorso, più le auto mediche e l’elicottero per i casi più urgenti. 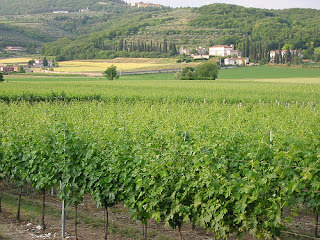 The club ride today was to Molina which is a very small village in the Lessinia Nature Park in Verona province. Once you arrive at Fumane it's a challenging climb up to Molina. With 30 km to go to the finish at Pinerolo it started raining at the finish line. 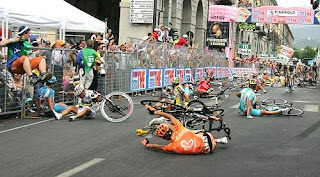 With the stage ending in a sprint finish it was clearly going to be dangerous. After the first few sprinters made it through safely a Tinkoff rider slid. 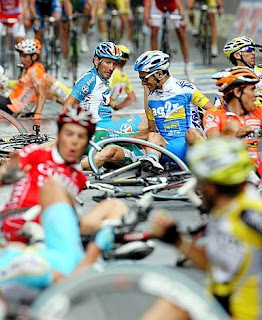 Bettini was forced into him and then as other riders attempted to brake it became a field of carnage. In Spring and Fall it's fairly common to see cyclists with heavily loaded bikes winding their way to Verona. They come from Austria and Germany, and beyond, using bike paths. The bike paths almost reach Verona and it's the "almost" part that gets challenging for these long distance riders as they try to find their way to the heart of Verona. Recently we found Wim and Els Rensink, from Holland, on a back road looking at maps. We offered to lead them into Verona and we invited them to join us for our traditional Wednesday lunch. They accepted our offer and a good time was had by all. 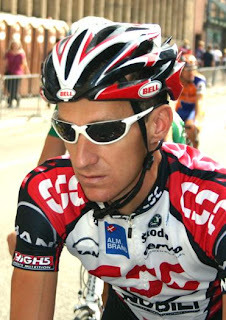 CSC's Kurt-Asle Arvesen is Norwegian but lives and trains at Lago di Garda according to the RAI announcers. Today he won the 200km Stage 8 from Barberino Di Mugello to Fiorano Modenese. It's no wonder some of these guys I see riding around here look so strong! I know some of you have been patiently waiting for frames that are in the works. In some cases it has been many months. For this I apologize.Unfortunately, I have been sick off and on for the past six weeks or so and often couldn't find the energy to work. It became so bad that I sought medical attention. After extensive testing I have just learned that I have cancer, in the form of Lymphoma. I will start treatment, including chemotherapy, next week. My doctors tell me that the response to these types of treatments is individual. Different people can react to the treatments in vastly different ways. They cannot predict how it will affect me. It is not known if I will be able to return to work the day after each session or if it will be two weeks or even longer before I have the strength. I do, however, have the desire to fight this disease on my own terms, not from a recovery bed. I will continue work to complete the orders I have in hand as well new orders as they come in. However, I cannot put a timetable on any orders at this juncture. Please continue to be patient and be assured that no short cuts will be taken to rush frames out the door that aren't up to my usual standards. 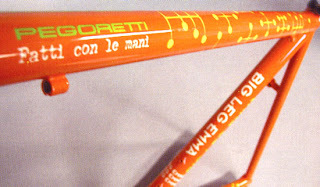 If you have questions or concerns about your order, pending or future, my well being or anything else please direct them to the Dario Pegoretti distributor in your country. While I enjoy receiving emails from customers around the world I will not be answering them for the foreseeable future. Please accept my apology for this and understand that I will still read every email I receive. Ciao,Dario"
Here's to wishing Dario well in his battle. There are so many cycling events on my cycling calendar that my head is spinning. Verona will be the finish for the crucial Giro d' Italia TT stage, and next to last stage, on June 2nd. It's going to be a day full of excitement in Verona. In the morning there will also be the "Pedalata Rosa" which is a non-competitive ride on the TT course. Everyone receives a free pink vest to wear so it's going to be a pink sea of cyclists. For me, it means riding out to Bardolino for the start, joining the Pedalata Rosa and riding back into Verona, and then trying to find a good spot to watch the TT finish later in the day. 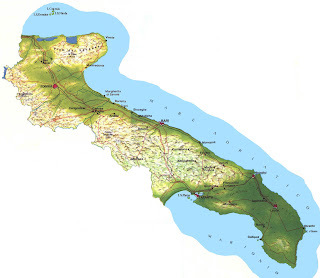 The Gruppo 1 "Puglia Tour" to southern Italy is next. That will be followed by the trip to France with Eros Poli's group to do several of the most famous climbs in the Tour de France. Later, it's off to the Gran Fondo Maratona dles Dolomites. Then it's off to see a stage of the Tour de France as a "VIP" (how can I be so lucky?). Mixed into all of this are all the club rides, radunos, etc. I like how Italians plan their trips. Last night about 40 of us got together at a charming restaurant on the shores of Lake Garda for dinner and to discuss details of the trip that is being organized by Eros Poli for next month. 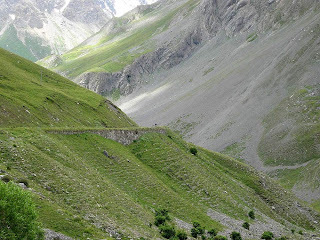 We will be climbing Alpe d'Huez, Galibier, Telegraphe, Izoard, and other famous climbs of the Tour de France. First, we were treated to an incredible sunset. Then it was 3 hours of good food (the seafood risotto was out of this world), wine and making new friends. The logistics were discussed with particular attention to clothing details. Even in June it can be cold on the mountain tops and you have to bring along a range of clothing to cover any eventuality. 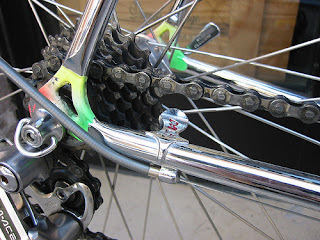 Last week I replaced the brake pads on my Pinarello as they were worn down almost to the limit; not a good idea to have worn brakes for the long descents. Training wise, every ride I've been taking lately is a climbing, climbing, and more climbing, ride. I'm also doing a lot of out of the saddle climbing which I was never good at but getting better at now. 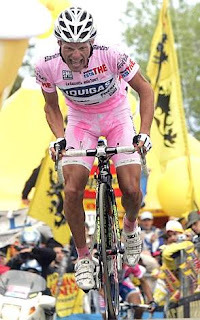 Four jerseys will be contested in the 2007 Giro d'Italia: the pink for leader of the general classification, the cyclamen for points leader, the green for climbing leader and white for the best young rider (born after January 1, 1985). 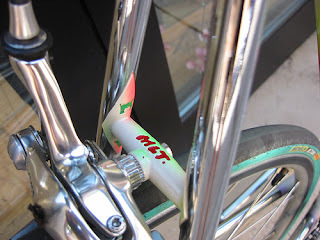 I regretted not taking my camera on Monday for my Escape from Bureaucracy ride. What to do? Do it again on Tuesday of course! It wasn't as perfect as Monday but it was certainly nice enough for some good photo opportunities.